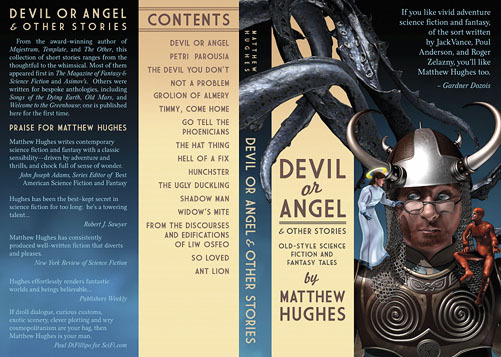 I’m more pleased than a bucket full of grinnets to show you my cover for Matthew Hughes’ new collection Devil or Angel & Other Stories – which is now available in eBook and printed form at Amazon, at Hughes’ own Archonate Bookstore, and elsewhere. You can get the book in epub or mobi format from The Archonate Bookstore, as well as the printed version. The mobi file is up at Amazon but the paperback version isn’t quite there yet . I’ve been formatting Hughes’ self-published books for a couple of years now, but this is the first time I’ve also done the cover illustration for one. This was a great one to do, too. Hughes’ work is often – though not always – humorous, as you may judge by the cover. Many of the stories in here remind me of those short, hilarious science fiction stories that Fredric Brown used to write; and since Hughes subtitles the anthology “Old Style Science Fiction and Fantasy Tales” I took that as permission to treat the cover a lot like some of the funnier covers for some of the funnier books that I used to harvest, on bicycle, from the used bookstores all over town during my peculiar childhood. Now, you may know Hughes best for his Archonate novels (like Majestrum, The Spiral Labyrinth, and others) but only one of these selections has ties to the Archonate. The rest are stand-alone tales, many from The Magazine of Fantasy and Science Fiction or Asimov’s, and a few that were commissioned for anthologies like Old Mars or Songs of the Dying Earth. 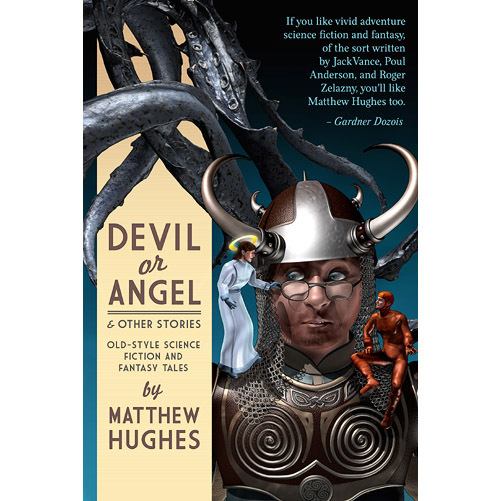 If you like vivid adventure science fiction and fantasy, of the sort written by Jack Vance, Poul Anderson, and Roger Zelazny, you’ll like Matthew Hughes too. Matthew Hughes writes contemporary science fiction and fantasy with a classic sensibility–driven by adventure and thrills, and chock full of sense of wonder. But, seriously, listen to me anyway. It’s great stuff. Would I steer you wrong? enter the CAPTCHA here and then hit the ENTER key.